BOB FAW, correspondent: We are very good at measuring what we make in this country and the services we provide. It’s called the gross national product. But 43 years after Robert Kennedy complained that the gross national product “measures everything except that which matters most,” economists like Carol Graham say maybe there should be an additional barometer. CAROL GRAHAM, Brookings Institution: We need more metrics to fully understand human well-being and human welfare and how to advance it. FAW: In other words, happiness, the subject of a torrent of recent books from the Dalai Lama to Harvard’s ex-president. Even in the academic world, “happiness” has become a cottage industry. 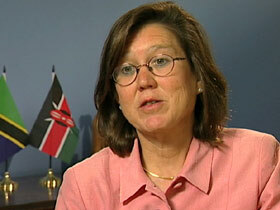 GRAHAM: There’s a search for a new paradigm with the financial crisis and the sense of were our fundamental’s wrong? Were we chasing the right goals? DAVID ROTHKOPF: Something like happiness, it sound frivolous, but it’s not frivolous. The purpose of society is to create a better quality of life for all the people. It’s not to create the highest amount of aggregate wealth. FAW: From the sublime moment of an artist in a performance, to children playing blissfully, to church-going ladies displaying their Sunday-best, we know what happiness looks like. But what exactly is it? 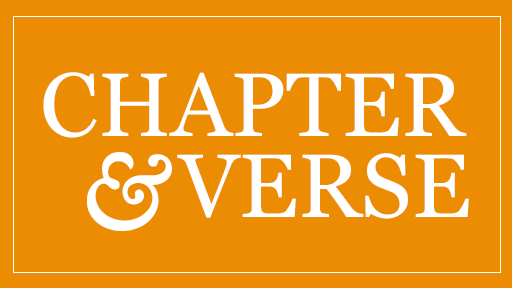 For the last eleven years Carol Graham has tried to measure happiness. GRAHAM: We’re getting a handle on this. There’s a new science of measuring it. We haven’t cracked all the codes and it’s not an exact science by any means but we do find some very consistent patterns. FAW: By surveying thousands of people about how they view their lives, if they smiled that day or were worried, Carol Graham found that money doesn’t necessarily guarantee happiness, that anxiety actually diminishes it, and that people of faith tend to be happier than people without. GRAHAM: One of the things that surprised me when I got into this enterprise was how common the determinants of happiness were around the world. People actually get happier as they age, as long as they’re healthy. Health is incredibly important, stable employment. Friendships and family tend to matter. Income matters but only up to a point. FAW: The fabulously successful internet pioneer and sports team owner Ted Leonsis had to learn what brings happiness the hard way. As a young man, he literally made a fortune, and found it was not enough. TED LEONSIS, entrepreneur : Maybe you’re lucky and you can start your own business and take it public and sell it, make a lot of money, and declare victory. And I did that in a really compact amount of time, and you get there and think: Is that it? Is that what the dream was all about? It’s not as fulfilling as you were told it would be. 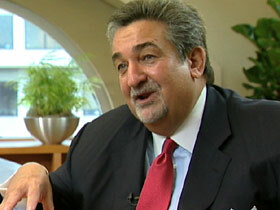 FAW: So after a near-crash in an airplane, Leonsis vowed to seek not wealth, but happiness. In his book, Leonsis outlines five steps to happiness. One of them: Empathy. For example, after making a harsh statement about his cleaning crew. 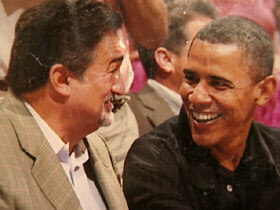 LEONSIS: I’m sitting next to President Obama. ESPN reports on it live, first time a sitting president has gone to a game. Game ends, president leaves. I’m feeling like a million bucks. And now it’s, let’s go clean the women’s bathroom. FAW: Leonsis says he did it to show empathy for the clean-up crews. LEONSIS: It really taught me a lot. It’s a year later. No one in our company of 1500 people ever talks about me sitting next to the president of the United States. But they all reference when I cleaned the women’s bathroom and showed empathy. FAW: Leonsis says what he has also found is that truly happy people recognize what he calls “a higher calling.” To leave in this world more than you take. LEONSIS: People who give back, who are self-reflective of their role in society, they tend to be the people that are role-modeled, that are remembered, that are loved. 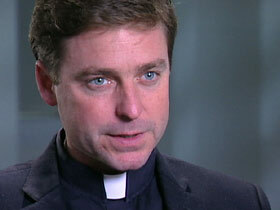 FAW: Father Jonathan Morris, vicar at St. Patrick’s Old Cathedral in New York City, has also written a book about happiness. FATHER JONATHAN MORRIS, St. Patrick’s Old Cathedral: Part of finding out who we are and flourishing at the deepest levels of who we are, has to do with helping my neighbor. And that’s part of really tapping into this notion of a search for meaning and purpose and the pursuit of happiness. FATHER MORRIS: Which means connecting to my very origin, my essential origin and somehow developing a relationship with him that gives us purpose, a special type of purpose, and then gives us joy. FAW: In his blueprint for happiness, even Ted Leonsis, hardly an avid church-goer, says stay in touch with a higher being. LEONSIS: Some people interpret that as meditation, some interpret that as your inner voice, some people interpret that as prayer. Regardless of how you personally internalize and make an outcome of it, I think that is a very, very important part of the process of finding what makes you happy. FAW: All that research on happiness does have real-world implications. For example, if a lack of medical care causes anxiety, shouldn’t government pay more attention to health care than, say, general prosperity? Or, maybe we should do what they’re trying in Bhutan. GRAHAM: It’s hard to imagine increasing contentment being a goal that we would agree on as a public policy objective, at least not in the United States, which is a very opportunity-focused society. But I do think we could agree that giving more people the opportunity to lead fulfilling lives is an objective of public policy that fits with everything our country is about. FAW: After all, despite our enormous wealth, in quality of life surveys taken in various countries by Newsweek and Gallup, the US doesn’t even make the top ten. 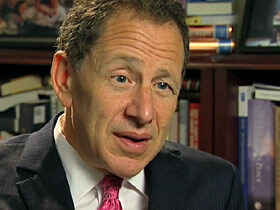 ROTHKOPF: What could we do to improve the quality of people’s lives? Is it education, health care, rewarding jobs, environment? You find there are a lot of measures of quality of life and you find the countries that do better than we do, in terms of those metrics of quality of life, actually have an approach towards government where government sees its role as providing those things. FAW: Even hard-headed businessman Leonsis agrees we should focus less on things like the gross national product and concentrate more on what really matters. LEONSIS: You don’t necessarily win if you’re successful. There’s lots of miserable wealthy people. There’s way more people who if they focused on their communities, their giving back, they’d be much happier in their life. FAW: Happiness then has many faces. And what all the books, and all those academic studies suggest is that happiness is elusive, is a process, not an end-point. After all, said Albert Einstein, everything that can be counted does not necessarily count; everything that counts cannot necessarily be counted.